Developed for high plate voltage applications. The Ruby EL34BHT's were developed for very high plate voltage applications. They have the same gold plated grid and extra thick glass as the BSTR's, but with the addition of welded wings on the plates these are a perfect option for Bogner amps and others. The tone is sweet on top with a perfectly balanced mid-range emphasis, not too compressed, and a firm focused low end that has become a favorite choice for hifi applications. Just wanted to let you know I'm really digging the EL34BHT's - they're a little crisper and sharper sounding than the E34Ls I've been running since forever. I was a little freaked out because the bottles are nearly a cm different in length, but the tubes are performing exactly as advertised. It's reassuring to see there's more than one decent option for modern EL34s! Thanks for the advice on tubes. After doing quite a bit of research I finally made the decision to mod my 20th anniversary Shiva from KT88's to EL34's. These were actually recomended to me from the Bogner shop and they even mentioned you by name as a place to get them. Pretty good endorsement if you ask me! My KT88's were starting to get noisy and after checking their bias they had drifted really bad in a matter of weeks. Enter the mod and these gems. They sound great and are very quiet. Nice job on the matching too. After biasing they weren't even one point apart from each other! Thanks for the advice and the tubes. I'm REALLY happy with this purchase. My amp sounds badass... I can't stop playin'!!! Thank you for the tube recommendations for my Shiva. It sounds better then ever and is dead quiet! 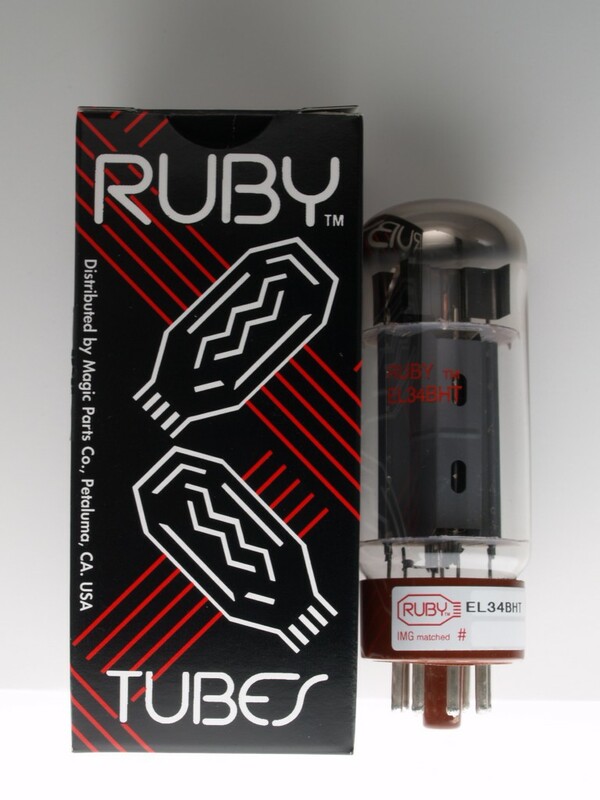 The Ruby EL34BHT's are a wonderful replacement for the old SED winged Cs and I will let all my guitar buddies know where to purchase them! The 12AX7AC5 HG+ pre's really make the Shiva shine. No more noise, the clean side is heaven, and the gain side roars! I would also like to comment on the packaging / shipping. I ordered on a Thursday evening and had them in my amp Monday afternoon. The packaging was superb and gave me complete confidence out of the box! Needless to say you have one very happy customer. Thank you.